Caterpillar Local Host Plants: Cassia mimosoides (Family: Leguminosae, Caesalpinoideae). 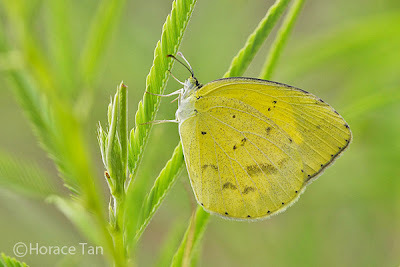 A No Brand Grass Yellow resting on its host plant. 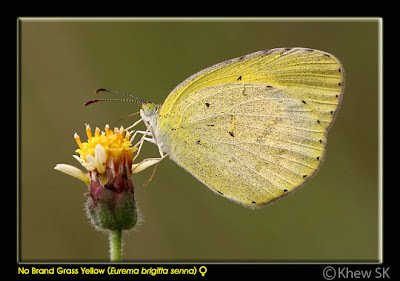 Above, each of the deep lemon-yellow wings has a black border which is regularly scalloped The black border on the forewing is not deeply excavated between veins 2 and 4 as in the other species of the Eurema genus. Underneath, the wings are yellow with freckled brown spots, more on the hindwings than the forewings. There are no cell spots on the forewing - a characteristic that is mainly used to identify the lookalike species in the genus. Males do not have an elongated patch (the brand) above and below the basal portions of the cubital vein on the forewing. 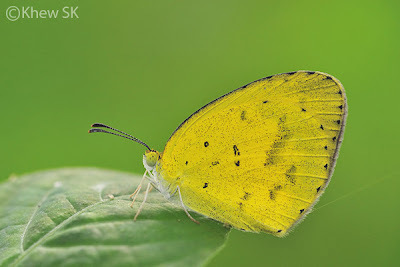 The underside of the females are more distinctive in that the hindwings are much paler yellow than the forewings. 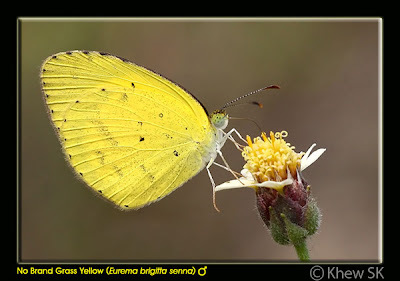 A female No Brand Grass Yellow taking nectar. Note the paler hindiwng underside. A male No Brand Grass Yellow taking nectar. 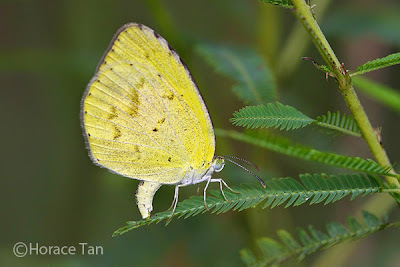 Field Observations of Butterfly Behaviour: This species is uncommon in Singapore. It was recently re-discovered in an open patch of reclaimed land slated for development. 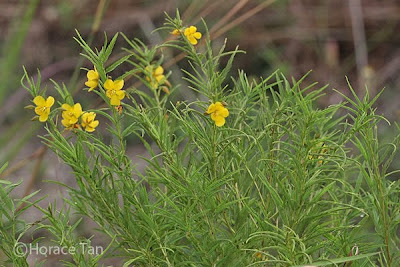 The host plant is not commonly seen, and this may be the reason why this species was not observed for a long time in Singapore. At its natural habitat, the No Brand Grass Yellow fly in rather sizable numbers in the vicinity of the host plants. Typically on a sunny day, the adults can be seen fluttering in the nearby open grassy areas and feeding on wild flowers from time to time. This species has also been sighted in one area on Pulau Ubin. The host plant, Cassia mimosoides, is a sub-shrub up to 1.5m high with variable stems, usually puberulent with short curved hairs. Inflorescence is supra-axillary or axillary with one to three yellow flowers. The leaves are pinnate, 3-12cm long and 0.8-1.2cm wide. Each compound leaf has 30-60 pairs of leaflets, each of which is 3-10mm long. The early stages of the No Brand Grass Yellow feed on relatively young leaves of this host plant. Host plant: Cassia mimosoides growing in a coastal wasteland. 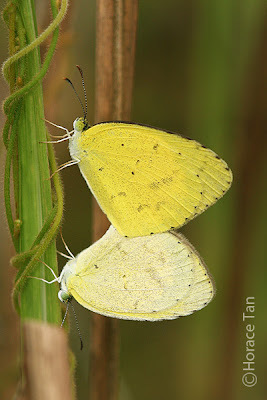 A mating pair of the No Brand Grass Yellow. 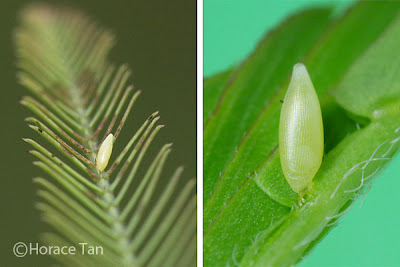 The eggs of the No Brand Grass Yellow are laid singly at the upperside of a leaflet or the rachis (main vein of the compound leaf) of the host plant. The long spindle shaped egg is laid standing at one end with a length of about 1.1-1.2m. It is pale yellow in color and has many fine vertical ridges and numerous indistinct and intermittent horizontal ridge lines. The micropylar sits at the tip of the standing egg. A female No Brand Grass Yellow ovipositing on the compound leaf of its host plant..
Eggs of the No Brand Grass Yellow : far and close-up views. The egg takes about 2 days to hatch. The newly hatched has a length of about 1.4mm and has a pale yellow head capsule. It has a cylindrical and pale yellowish green body covered with rows of tubercles running lengthwise. Each tubercle has a setae emerging from the middle of it. The two rows of tubercles flanking the dorsal line are much larger with longer satae than the rest. A miniscule droplet of fluid can be found at the tip of each setae. It has been reasoned that the droplets contain chemicals which serve the purpose of repelling parasitic insects. The droplet-bearing setae is a feature present in all five instars of this species. 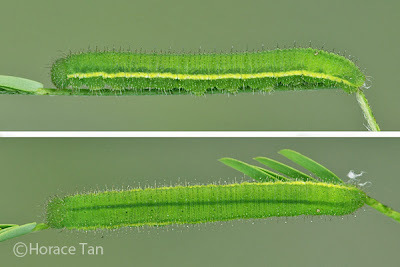 Two views of a newly hatched caterpillar of the No Brand Grass Yellow, length: 1.4mm. After hatching, the young caterpillar eats the empty egg shell for its first meal, and then moves on to eat the young leaflets nearby. 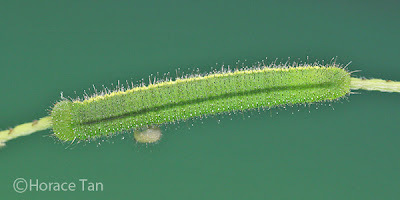 The growth is moderately paced and the body length reaches about 3.5mm in this 1st instar which lasts for 2.0-2.5 days. 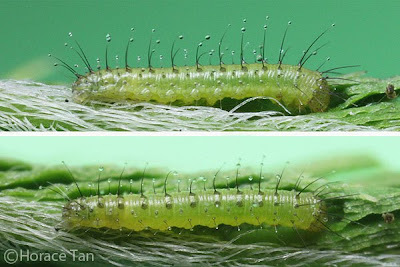 Two view of a 1st instar caterpillar of the No Brand Grass Yellow, length 2.3mm. Note the fluid droplets evident at the tips of most setae. 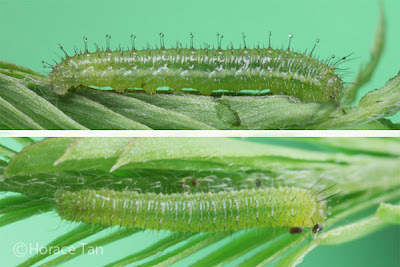 Two views of a late 1st Instar caterpillar hours before its moult, length: 3.3mm. 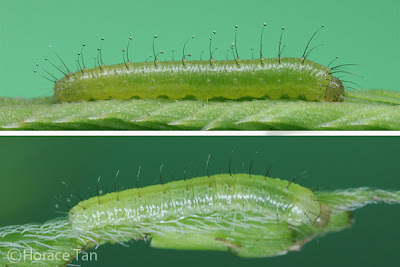 The setae on the 2nd instar caterpillar are proportionately shorter and greater in number. There is a faint dorsal line which is darker than the base color of pale green. A pale white to yellowish band runs laterally along each side of the body. The head capsule is still pale yellowish green. This instar lasts about 2-2.5 days with the body length reaching 5mm. 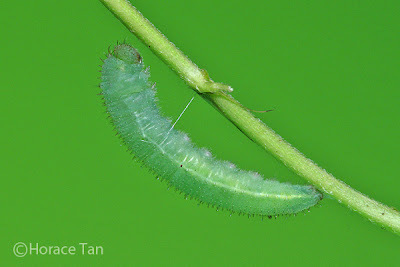 The 3rd instar caterpillar has a yellowish green body with a green head capsule. Its setae are again proportionately shorter compared to the previous instar. The dark dorsal line and the lateral white/yellowish bands, first appeared in the 2nd instar, have both become more distinct. This instar takes about 2-2.5 days to complete with body length reaching about 9mm. 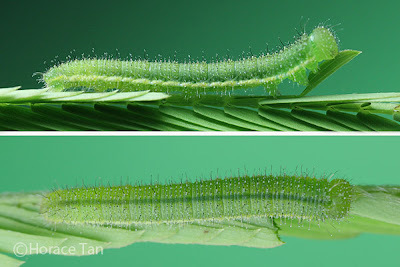 Two views of 3rd instar caterpillar, late in this stage, length: 8.8mm. The appearance of the 4th instar caterpillar is little changed from that of the 3rd instar. The lateral bands take on a greater hint of yellow, thus creating a stronger contrast against the green base color. This instar lasts 2-2.5 days with body length reaching about 15mm. 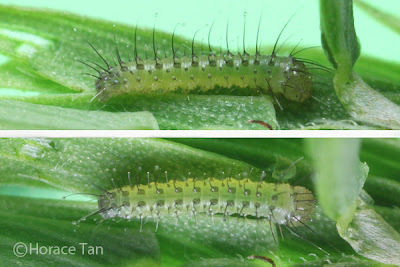 Two views of a 4th instar caterpillar feeding on a leaflet, early in this stage, length: 9.5mm. The caterpillars of the No Brand Grass Yellow are neat and meticulous eaters. 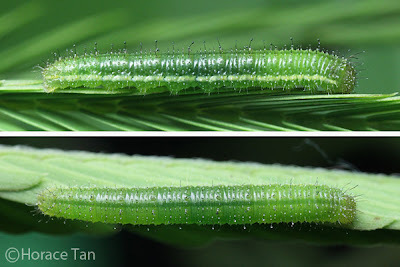 Typically each caterpillar systematically devours all leaflets (30-60 pairs), one leaflet at a time, on a single compound leaf of Cassia mimosoides before moving on to the next. For each leaflet, a 4th instar or 5th instar caterpillar will methodically start with eating one half of the lamina from the base, and then finish the remaining half by eating from the distal end. The following video clip shows the 2nd half of an eating session on a leaflet by a 4th instar caterpillar. The 5th and final instar caterpillar resembles the 4th instar caterpillar closely. The one visible change is in the lateral bands which have taken on a striking yellow coloration. The 5th instar lasts for 3-3.5 days, and the body length reaches up to 25mm. 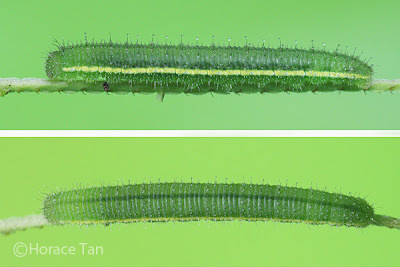 Two views of a 5th instar caterpillar, newly moulted, length: 15mm. 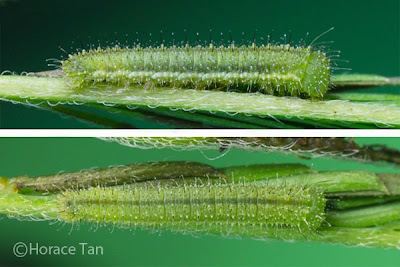 Two views of a 5th instar caterpillar, length: 20mm. 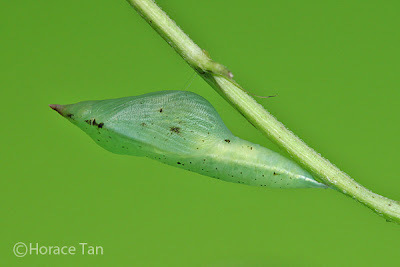 On the last day of the 5th instar, the body of the caterpillar shortens and changes to a dull shade of dark green. It ceases feeding and comes to rest on the underside of a stem/stalk on the host plant. Here the caterpillar spins a silk pad and a silk girdle, with which the caterpillar soon become immobile in its pre-pupatory pose. A pre-pupatory larva of the No Brand Grass Yellow on a stem of the host plant. Note the silk girdle featured at the first 2-3 abdominal segments. Also the posterior end is secured via claspers to to the silk pad on the stem. Pupation takes place about 0.5 day later. 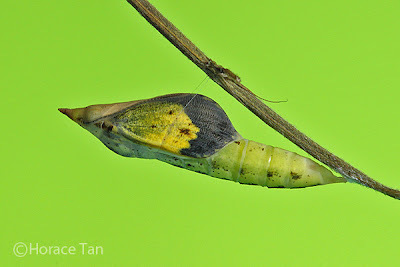 The pupa secures itself with the same silk girdle as in the pre-pupal stage, but with cremaster replacing claspers in attaching the posterior end to the silk pad on the stem, The thorax of the pupa is compressed and the wing pads join to form a deep keel. The head of the pupa has a short pointed snout at its end. The green pupal body is speckled with dark brown to black spots and patches. Length of pupae: 18-19mm. The pupation event at 2 times the actual speed. Note the crucial role of the silk girdle in supporting the pupating larva, and the attachment of the cremaster to the silk pad at the 2.47 time mark. A pupa of the No Brand Grass Yellow. A mature pupa of the No Brand Grass Yellow. The now transparent wing pad show s the yellow forewing upperside with its black border. After about 4 days of development, the pupal skin turns translucent as the development within the pupal case comes to an end. The yellow coloration and back borders on the forewing upperside are now discernible. The following day, the adult butterfly emerges from the pupal case. 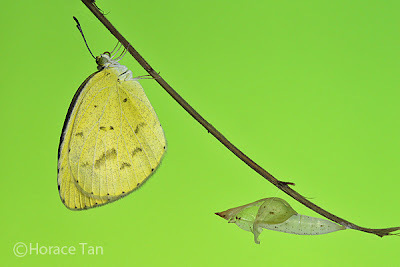 A newly eclosed No Brand Grass Yellow drying its wings near its pupal case. 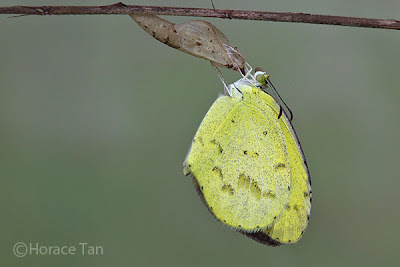 A female No Brand Grass Yellow drying its wings on its pupal case.